This year, the United States will release nearly three-quarters of a million people from prison, a record high. Nationally, 2.3 million people are in prison in the United States, and 95 percent of them will, at some point, get out and go home. Society has a strong interest in keeping them home — in helping them to become law-abiding citizens instead of falling back into their old ways and returning to prison. But American programs for newly released prisoners echo the typical follies of our criminal justice system: our politicians usually believe that voters only want the emotional satisfactions of meting out maximum punishment, even if these policies lead to even more crime. The usual package granted to someone released from prison in New York state is $40, a bus ticket and the considerable stigma that follows an ex-offender. Since prisoners are often held far away from their families and states charge astronomical rates for prison phone calls, prisoners often lose touch with their loved ones and may not have anyone to take them in when they get home. They may arrive in their home cities with no plans, other than — worrisomely — those hatched with fellow prisoners. They have little prospect for jobs or housing. Since many don’t get effective drug treatment in prison, they might still crave a fix, which costs money. It is little wonder that some former prisoners fall back into crime within hours or days. Returning prisoners need many things: stable housing, drug treatment, job training, G.E.D. (high school equivalency) classes, parenting lessons, anger management. But even the handful of people who do worry about ex-offenders rarely mention what may be the most crucial need of all: a better class of friends. Former prisoners go back to their old neighborhoods and meet up with their old gang, or new people of the only type they may be comfortable with — criminals. But what people need is to stop hanging out with associates who tempt them with promises of easy money or drug-filled nights. They need to start hanging out with people who think about the consequences of their actions, who value legitimate jobs, sobriety and family — people who go to their A.A. meetings and G.E.D. classes, who are trying to rebuild their lives. How important are the right friends? We know that people get into crime and gangs primarily because their friends do. Hanging around with delinquent friends encourages young people to think of themselves as delinquents, and puts them in a world where criminal behavior is easy to engage in and brings social rewards. We do not know as much about whether pro-social peer groups can turn people away from crime. But it is reasonable to believe that the right peer group can help. 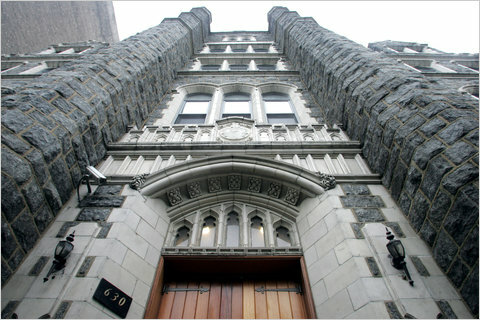 In West Harlem there is a large and beautiful Gothic building overlooking the Hudson River. It is called the Fortune Academy, but it is known to all as the Castle. It is owned by the Fortune Society, a group dedicated to helping returning prisoners succeed with starting new lives. The Fortune Society helps about 4,000 newly released prisoners each year with job training and placement, drug treatment, classes in cooking and anger management and being a father, and G.E.D. studies. Most of the people who work at Fortune were once themselves drug addicted, homeless or imprisoned. This is important. “The clients can look at the staff and say, ‘a few years ago, that person was where I am,’” said Glenn E. Martin, Fortune’s vice president of development and public affairs. (He himself served six years in prison, and was released nine years ago.) The staff can also see past appearances: “Some others may see a guy with his pants pulled down and his hat on, yelling, and say ‘he’s not ready,’ ” said Martin. “But we’ll talk to him.” The credibility and understanding produced by having a staff of former offenders is important. But about 300 of Fortune’s clients each year get something more: a bed in the Castle, and the chance to start a law-abiding life in the company of other people trying to do the same. The Castle provides solutions to several of the most important problems facing newly released prisoners. One is housing. Between 10 and 20 percent of people released from state and city prisons and jails have nowhere stable to go — they couch surf with friends or go into homeless shelters. But a stable home is a prerequisite for all the other things needed for a productive life. The Castle can be that home for a few nights or many months, until the person can find work and safe housing he or she can afford. Anyone newly released from prison with nowhere else to go can apply to live in the Castle. Open beds are filled by the first qualified applicant, but the Castle turns away at least 10 people for every one it accepts. Prisoners throughout New York state apply — because the Fortune Society has physical offices in some jails and prisons, the parole bureaucracy refers them and because prisoners themselves spread the word. “We get several thousand letters a year,” says JoAnne Page, the president and chief executive of the Fortune Society. “We get referrals from people’s mothers.” The Castle has single rooms for residents who earn them; the rest have roommates. It serves meals and has staff on duty around the clock. It has a computer lab, laundry and a cafeteria. Residents are required to go full time to counseling, services such as drug treatment or job placement, or to school. But perhaps more important than housing, the Castle gives people a new group of friends to identify with. Every Thursday night at 6 the Castle has a group meeting of all its residents. At one recent meeting, people sat around an enormous table and talked about the successes of their week. One woman talked about her job as a janitor at a shelter for women. “It’s a safe place, and clean — that’s because of me,” she said with pride. One man recounted a speech he attended by a political candidate. Another said he opened a bank account for the first time in his life. One woman was applying for jobs and wondered aloud how best to phrase the information that she was a felon. JoAnne Page took the opportunity to deliver one of Fortune Society’s key messages: You are not a felon. You committed a felony and did your time, but that is not who you are. One man announced that the Castle’s chorus was rehearsing and was open to new members. The residents applauded each other fervently. Delancey Street, in San Francisco, is a very different community with the same purpose. People come to live at the Delancey Street residential building for an average of four years. Each resident is required to get at least a high school equivalency degree and learn several marketable job skills, such as furniture making, sales or accounting. The organization is completely run by its residents, who teach each other — there is no paid staff at all. Teaching others is part of the rehabilitation process for Delancey residents. The residence is financed in part by private donations, but the majority of its financing comes from the businesses the residents run, such as restaurants, event planning, a corporate car service, a moving company and framing shop. All money earned goes to the collective, which pays all its residents’ expenses. At both Fortune and Delancey, a person emerging from prison is surrounded by a community of people who support him, hold him accountable, teach him skills and model good behavior. Many of the men and women in these programs come to think of themselves as productive members of society for the first time in their lives, and it may also be the first time they ever feel competent at anything besides lawbreaking. The Delancey Street residence, which began in 1971, has never been formally evaluated. But there is no question that is phenomenally successful. It has graduated more than 14,000 people from prison into constructive lives. Carol Kizziah, who manages Delancey’s efforts to apply its lessons elsewhere, says that the organization estimates that 75 percent of its graduates go on to productive lives. (For former prisoners who don’t go to Delancey, only 25 to 40 percent avoid re-arrest.) Since it costs taxpayers nothing, from a government’s point of view it could very well be the most cost-effective social program ever devised. The program has established similar Delancey Street communities in Los Angeles, New Mexico, North Carolina and upstate New York. Outsiders have replicated the Delancey Street model in about five other places. There is one possible caveat about the Castle’s effectiveness: most of the people I saw at the Castle were in their 30s or older. Older people who get out of prison, by definition, are more likely than young ones to have served long sentences for serious offenses. And the longer the sentence, the more disconnected and disoriented prisoners are likely to be upon release. So they are important clients for the Castle. But they are also at an age where people are leaving crime on their own, finally ready to accept some responsibility and aware they are not immortal and want a family and a stable life. Crime is a young person’s game. It may be true that many people at the Castle successfully turn around their lives. The question is whether their age would help them to do so in any case. There are two puzzles here. Delancey Street is now celebrating its 40th anniversary. One would think that by now there would be Delancey 2.0 models sprouting all over. But there are not. A related mystery concerns the idea that underlies both Delancey and the Castle: the importance of pro-social peers. Our guts tell us they matter; we know the effect our friends can have on our behavior. Peer pressure may be the single most important factor getting people into crime — surely it should be employed to get them out again. Yet it is not. Besides Delancey and the Castle, there is probably not a single government agency or citizen group working with former prisoners that lists “clean-living peers” alongside housing, job training and other items on its agenda for what former prisoners need to go straight. These two communities of former prisoners are good projects, but they have failed to have a wider impact. Saturday’s column will look at why this is the case.